The portable, ruggedized The NEW HandHeld2 covering 325 to 1075 nm offers streamlined field data acquisition with the imbedded light version of remote sensing software. The results are shown on an integrated, high visibility color display, so you are free to collect samples without the worry of carrying a computer. The HandHeld2 provides the ideal combination of performance, portability, and durability at an affordable price. 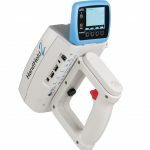 The HandHeld 2 Spectroradiometer employs a high sensitivity detector array, a low stray light grating, built in shutter, Drift lock dark current compensation, and second order filtering to produce high signal-to-noise spectra in under a second. Designed with an ergonomic dual position “D” handle, the HandHeld2 Spectroradiometer is equally convenient for right or left hand operation. The rugged HandHeld 2 weighs 1.13kg (under 3 lbs) including batteries.